Onset/offset Applique! 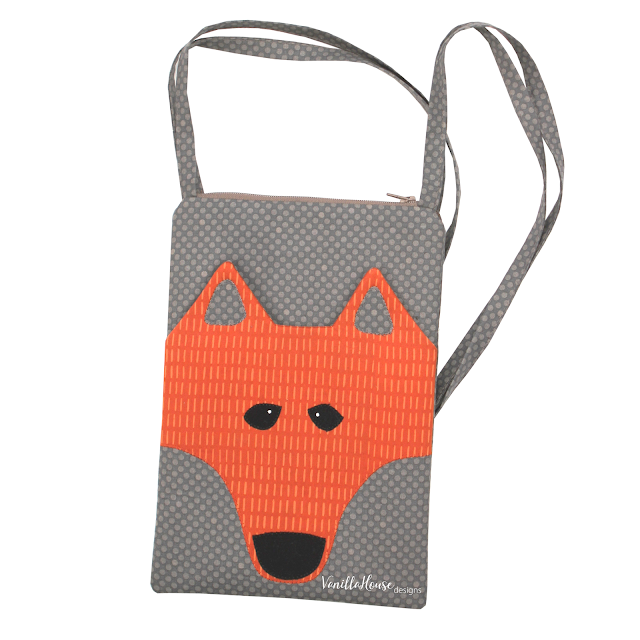 Foxy Pocket Purse is a good example! What in the world is onset/offset applique? I made up the term -- and if anyone has a better name, please! But I am loving this technique where part of the applique is stitched onto or into other fabric areas and the other part of the applique creates a finished edge. So Fish Fry from my previous post and shown again below has most of the 'fish head' sewn into the bias trim. And the 'fin edge' creates a finished edge. Foxy Pocket Purse has the nose of the fox sewn/appliqued onto the front purse panel, but the 'ears edge' creates the finished edge with the sides of the fox face sewn into the seams. 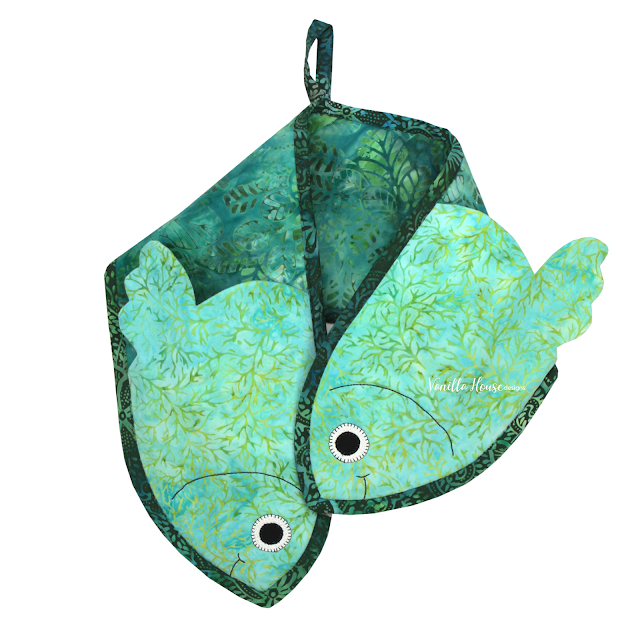 All these appliques are lined or you might say 'has a finished reverse side', so it can create a pocket or opening. Each version has its own custom instruction because they are made in different ways. More of this technique to come! Foxy Pocket Purse -- P223 or vhE223 for the epattern download. You are invited to a Fish Fry! It's been while. Every time I am working on new patterns, I seem to take a leave of absence from posting. I just don't know how to perfect the patterns and do anything else that distracts me. But I will have some posts all together here for the next while, revealing the latest three releases. They are ready and no other pattern projects in the feed dogs! So here's Fish Fry.....oven mitt! 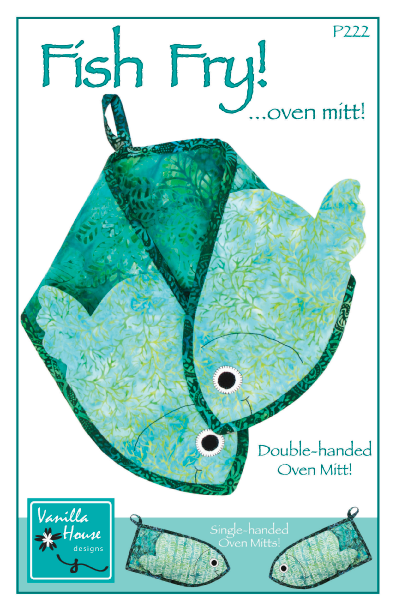 The wrap-around oven mitt is great for retrieving hot casserole dishes from the oven! There is thermal fleece on the side that touches the heat source and heavy-weight interfacing on the back-of-hand side. The back-of-hand side convexes a bit, making it real easy to slip the oven mitts on in a hurry! Versions include the double-handed mitt and a single-hand mitt! One size fits all! And as always in Vanilla House patterns, the instructions are very thorough, with an illustration per every step. This pattern is available in your local independent craft store (soon), or you can buy direct from our website, either a paper pattern by post or download an epattern (vhE222).